A recent study in Nature Nanotechnology shows augmentation of neurons by growing them on a base of carbon nanotubes. The author’s hypothesis is that this is due to the carbon nanotubes conducting electrical impulses from the axon back to the dendrites, thus acting as a shortcut for the normal process of back propagation of action potentials. Back propagation (propagation in the direction opposite to the arrow in the above diagram) occurs when the action potential flows not only along the axon, but also back to the dendrites. Back propagation of the action potential is required for synaptic potentiation, as it allows for extra excitation of the dendrites at those occasions when the axon has fired, thus leading to better coincidence detection via Hebbian learning (Magee and Johnston, 1997). Neurons strengthen connections based on the close timing between presynaptic and postsynaptic excitation (‘fire together, wire together’), so it is important for signals of postsynaptic excitation to propagate back to the dendrites where the synapses are, so that the synapse may be strengthened or weakened accordingly. In a sense, then, the augmentation of neurons in this study is similar to that seen in NR2B transgenic mice (aka ‘Doogie mice’), which overexpress the gene for a subunit of NMDA channel – a channel involved in long-term potentiation (LTP) of synaptic connections. The facilitation of more back-propagated action potentials would also result in enhanced learning and memory, if carbon nanotubes were seeded into key parts of the brain. This would, however, cause similar problems to the NR2B Tg mice. There is more to learning than simple recall, as forgetting is important too. We have a limited number of neurons to play with, and therefore a blanket increase in memorisation is an inferior solution compared to a highly-regulated memory augmentation, where things we need to remember are remembered and things we don’t wish to recall are forgotten. But, this study was basically a random arrangement of nanotubes and neurons, which created some interactions which proved to be functional. It will be very interesting to see future neurotechnology based on carbon nanotubes, as these ‘wires’ are small enough to connect not just to a single neuron but between individual parts of that neuron. Yet still many of the issues of brain-computer interfaces will exist even with the enhanced biocompatability afforded by the carbon nanotubes – one needs to be able to interpret signals used by neurons and compute them, and this computation needs to be done with a small, preferably implantable computer. Still, I have a feeling nanotechnology will be essential for any cyborg (which is the main reason I had nanotechnology as my second field of study on my Bachelor of Science, after my first love – neuroscience). Two Australian bioethicists, Julian Savulescu and Loane Skene, have a brief paper in the American Journal of Bioethics. It looks at using plant and animal genes and cells to enhance human beings and inserting human genes and parts into animal models, dealing primarily with a few of the commonly encountered ethical objections. One of the authors of this commentary (Savulescu) has argued [that] being a member of the species [H]omo sapiens confers no special moral significance. Dignity is conferred by properties that are typical of humans, such as rationality or capacity to respond to normative reasons, but there is no necessary or sufficient relationship between species membership and these dignity-conferring properties. I think this assertion, if accepted, basically demolishes most arguments for the prohibition of mixing humans and non-humans at the cellular or genetic level. The animal and plant kingdoms—the kingdom of genes—contain vast amounts of genetic information of potential value to humanity. Humans have many unique and valuable qualities, like the capacity for high-level moral reasoning. But they also have many limitations, which other animals and plants do not. We age faster than some animals,we do not have sonar, acute sight, hearing, smell, or the capacity to photosynthesize or produce our own essential nutrients. And we are susceptible to diseases other animals are not. Damn straight. Evolution has created some pretty cool things in many organisms, and we would be silly to waste that resource of ingenuity that took so many eons to formulate. We should mine it for all we can! Any living organism must be actively metabolising, or else it will not be able to sustain itself. Metabolism is the name given to the sum of all processes involved in producing and using energy, and forming and breaking down molecules, and disposing of the resultant waste. These can be divided into a number of steps, each catalysed by an enzyme, and the steps in turn can be organised into pathways. Catabolic pathways are those that break down molecules and release energy, whereas anabolic pathways are those that form molecules and consume energy. 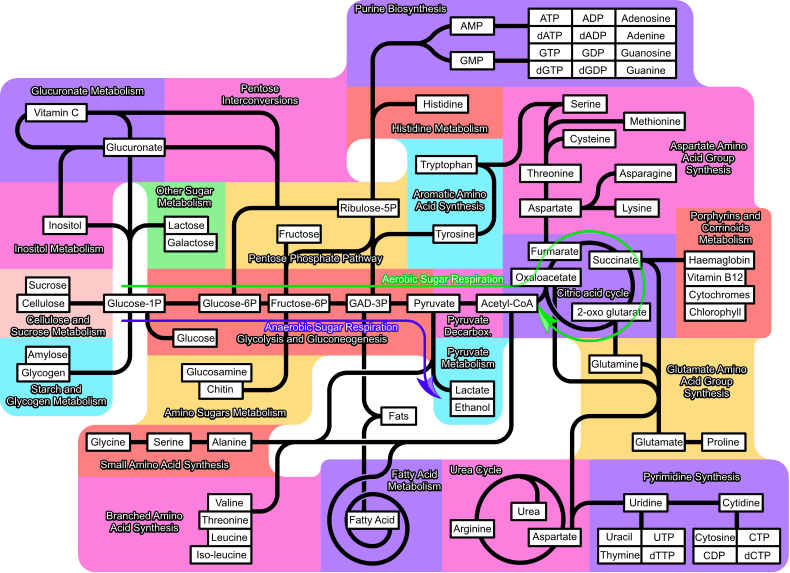 Altogether, these pathways can be represented as a metabolic network or map. There are some very large and detailed metabolic maps available, such as those seen at sites like iPath. It is obvious that if these networks were street maps, they would contain many one-way streets and dead-ends. This is because evolution is lazy. Well, technically evolution isn’t even able to think, let alone show a lack of motivation, but the point if a process can be omitted without negatively impacting the organism too much, a mutation to the enzyme responsible for that step in the pathway will not be selected against (or may even be selected for). Metabolisms of various organisms, therefore, are imperfect, requiring many nutrients, cofactors and minerals to function correctly. Humans are not exempt to the ‘laziness’ of evolution. As a well known example, is the inability of humans to produce vitamin C (and thus why it is called a vitamin). Sometime about sixty million years ago, the ancestor of the entire group of haplorrhines (a group that includes humans and other apes, as well as monkeys and tarsiers) had a mutation in the gene GLO, which codes for the enzyme L-gulonolactone oxidase (also known as GULO). This enzyme is responsible for the last step in a pathway that converts L-glucose to L-ascorbic acid, or Vitamin C (Nishikimi and Yagi, 1991). Because of this mutation, the haplorrhines have to eat food containing vitamin C to prevent illnesses like scurvy; this was never really a problem, as most haplorrhines are frugivores (eat a lot of fruit, rich in Vitamin C). Therefore, this enzyme remained lost in haplorrhines, with mutations building up in the gene unchecked and now in humans the last remnants of the gene can be seen as the GULO pseudogene on chromosome 8. It is therefore the case that each and every human inherited the metabolic disease hypoascorbia. Being the fun sorts that we are, humans have tried to fix this. Using genetic engineering to insert a functional copy of the GULO gene from mice into human cells, researchers had already shown that vitamin C synthesis was restored (Ha et al, 2003). More recently, scientists genetically engineered mice to have both copies of their GULO gene knocked out, then re-inserted the gene to restore ascorbic acid synthesis (Li et al, 2008). Genetic technology, then, may allow us to restore many similarly lost enzymes to the human metabolic system, and even to take enzymes that evolved in other organisms and put them to use in our body. With appropriate regulation, this would cure the scourge the scourge that is nutrition disorders. Those in poorer nations are often afflicted with hypoalimentation (malnutrion) and those in richer nations have problems with hyperalimentation (especially obesity), both caused by the human metabolism being an innefficient hodgepodge of enzymatic pathways. For a human enhanced with a plethora of new metabolic pathways these nutrition disorders would be far less of a problem. Enzymes would be available to get from each point on the metabolic map to any other point, as many of the essential nutrients, those required nutrients that normal humans cannot synthesise internally, are produced in other organisms (such as the amino acid tryptophan, produced in plants and microorganisms but not in animals). With proper regulation, the body will do the balancing of your diet for you, so you can healthily live on chocolate and ice cream (though probably still with the need for mineral suplements in pill form, as no enzyme can convert one element to another). In addition, this could potentially alleviate undernutrition too, by broadening the range of foods available for human consumption to include anything eaten by living organisms. With the genes for cellulysis, cellulosic plants could be digested without the need for a gutfull of cellulase-producing bacteria. With enzymes available to break toxins, contaminated or poisonous food could be consumed. And with novel enzymes, other carbon-based materials like plastics (i.e. rubber, polystyrene, polypropylene) could be digested, though this may make medical applications of those plastics more difficult – you don’t want to digest your pacemaker or cyborg implants (at least, not usually). It may even be possible to add organelles responsible for photosynthetic anabolism, allowing for sunlight, carbon dioxide and water to be used as raw materials for the human metabolism. A human enhanced in this way would be the ultimate survivalist, able to consume a wide range of foods normally inedible to humans (of course, taste receptors may have to be adjusted somehow to make these foods palatable). You are currently browsing the Human Enhancement and Biopolitics blog archives for December, 2008.